Introducing our exclusive 70 in. Winslow Double Bathroom Vanity Sink Console with Pearl White finish perfectly combines sleek contemporary design with optimal concealed storage space for a truly exceptional bathroom vanity design. Double white porcelain oval under-mount sinks specifically selected for this popular double vanity. It is completed with the Satin Nickel pull handles. Cabinet built with 3 side opening doors, 4 faux drawers, and 5 functional drawers built with dove-tailed drawer joinery with finger-joint panel. The vanity cabinet drawers are solid wood (front, back and sides) with finger joined boards and dove-tailed joinery, the best money can buy. All drawers and cabinet doors are on soft closing mechanism that usually reserve only for custom cabinetry. We must mention 3 of the 5 functional drawers are concealed behind the center door with ample space for towels and other accessories. We do not warrant the back splash for matching characters nor breakage. 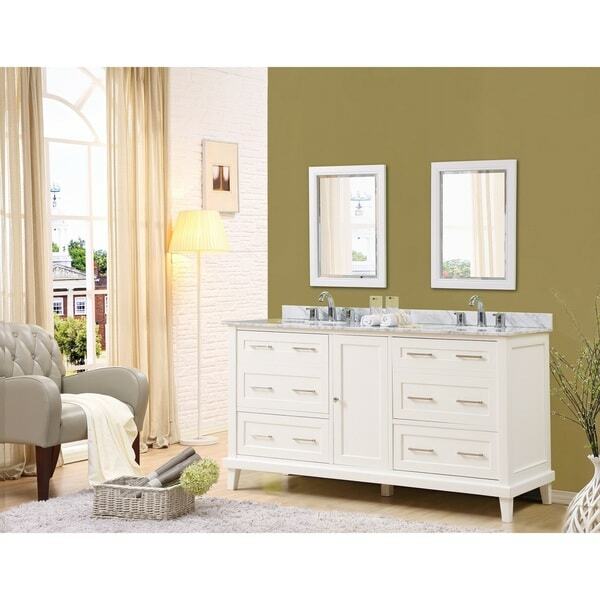 This vanity is very solid and has a great quality feel and function. It arrived extremely well packed with zero damage. Looks great! We're very happy with our purchase! This vanity is well made and looks amazing! the product itself is great, but i got a miscolored item. The item was installed before i noticed the issue. The item was pretty old, it's supposed to be white, but turned yellow on the surface. "What is the length of the drawer pulls and the distance between the drilled holes. I may want to swap out the pulls and wanted to know this detail." "Can the legs be removed"